Singapore has all the right characteristics to become a world leader in the Bitcoin and blockchain industry. Singapore has been rated as one of the most “technology-ready” nations in the world, due to the ubiquity of its internet, openness to innovation, and well-established digital economy. Additionally, Singapore’s sophisticated market economy provides the basis for the impressive wealth of its citizens, who enjoy the world’s 3rd highest per capita income. As if such favourable factors weren’t enough; this Southeast Asian city-state is an established hub for global finance, commerce, and trade. Singapore is also regarded as something of a tax haven for its low income tax, as well as various exemptions on capital gains and foreign earnings taxes. Further, Singapore is has a highly-educated population able to grasp the complexities of cryptocurrency. The combination of all these positive factors - all known spurs to crypto adoption - could only be stymied by government hostility to crypto… Fortunately, Singapore’s government has proven itself open-minded and supportive towards fintech innovation, whilst also taking responsible steps to curb fraud. Singapore’s regulators were among the earliest to adopt a clear stance on Bitcoin, choosing a permissive approach. Many crypto businesses have been attracted to the region as a result, some even incubated by a government-backed accelerator program. Multiple crypto conferences have also been held in Singapore over the years, indicating a large and active local community. If you’re in Singapore and looking to get involved in the Bitcoin revolution, this guide contains a quick rundown on the regulatory and tax situation in Singapore. We’ll also explain how you can quickly and easily purchase your own bitcoins from the Coinmama website, using any credit or debit card issued by either VISA or MasterCard. In late 2017, the MAS issued a warning on the risks of crypto speculation. This proved timely, as crypto markets headed downwards soon after. The MAS also issued warnings on the high risks of ICOs in mid-2017, warnings which have again been borne out by subsequent events. From these warnings, it’s clear that regulators are following developments in the crypto space closely. 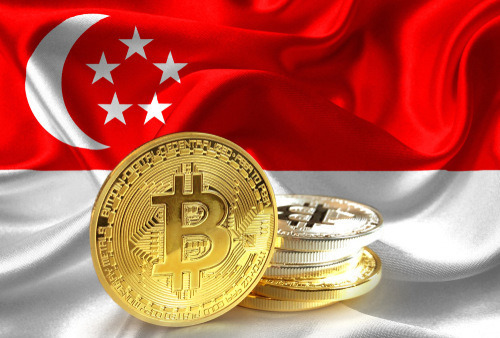 In February of 2018, Singapore’s Deputy Prime Minister and Minister of MAS announced that the agency is developing a regulatory framework for crypto payment services. This regulation is intended to prevent money laundering and terrorist financing, and is likely to impose KYC (Know Your Customer) and AML (Anti-Money Laundering) requirements on local exchanges. However, it was also emphasized in the PM’s address that no crypto ban is envisaged. Singapore’s Inland Revenue Authority has determined that, for taxation purposes, Bitcoin will be treated not as a currency but as a good. The upshot is that the Goods and Services Tax of 7% will apply whenever a business accepts Bitcoin as a form of payment - but only for real-world goods or services. Virtual goods and services are exempt under Singapore’s existing tax laws. Capital gains taxes from Bitcoin investment are also exempt from taxation. It therefore appears that individuals, as opposed to businesses, are under no Bitcoin-related tax obligations. Coinmama recommends that our clients confirm this impression with a tax or legal professional. Many exciting blockchain projects are happening in Singapore, such as KrisPay; the blockchain-based “air miles” reward system adopted by Singapore Airlines (SIA). Another good example is the Open Trade Blockchain (OTB). Developed by a company owned by Singapore’s government, this service uses a blockchain solution to improve international trading, particularly in the ASEAN region. Also encouraging was the Memorandum of Understanding signed in March 2018 by the Singapore Fintech Association and its Japanese counterpart. These organizations agreed to cooperate to the benefit of their respective crypto industries. Also highly significant is Project Ubin, the MAS’s own experiment in blockchain technology. Interested in becoming a part of this transformative new industry? Coinmama allows people in Singapore to buy bitcoin (BTC) with Singapore dollars, using either their credit or debit cards. At this time, only cards issued by VISA or MasterCard are supported. Head to the Coinmama website and select the blue “Sign Up” tab. You will need to enter your email, password, first name, last name and your country of residence. If you already have an account, just sign in with your login details. For more information on how to create an account with us, click here. To purchase bitcoin (BTC), you first need to become verified. It is necessary to upload your ID or passport, plus various other documents depending on which level of verification you wish to reach. For further help with account verification, please click here. Once signed in and verified, navigate to the “Bitcoin” tab in the top menu bar. Once there, you will be presented with several choices: either purchase a set amount of BTC ,or enter in a custom amount of up to roughly $5,000 (as of the time of writing). Supply your Bitcoin wallet address; this is where we’ll send the bitcoins which you purchase. Next, select the “Proceed to checkout” button. Complete the form with your relevant details. Make sure that your card details, such as your address, correspond with the details you supplied when creating your Coinmama account. Finally, proceed to payment by clicking on the “Pay now” button. Note that only VISA or MasterCard are accepted. Once your payment has been made, the order status will read “In Process.” This means that your order is being processed by the card company. After a few moments, the order will be processed and the payment will be approved. Your wallet then needs to be confirmed. In approximately 10 minutes, you will receive payment to bitcoin at the address you supplied. After a further 10 minutes or so, this transaction should appear as confirmed within your wallet. Note that during times of especially high traffic, your transaction may take slightly longer to confirm. Singapore is definitely ahead of the global curve when it comes to cryptocurrency acceptance and integration. All signs point to the continuance of this trend, as Singapore is emerging as one of the best places in the world to be a Bitcoiner or to run a Bitcoin business.